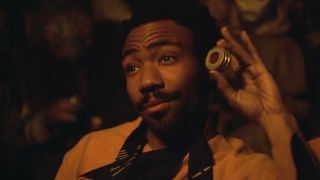 C-3PO isn’t in Solo: A Star Wars Story. Yep, that’s right. Despite appearing in every single Star Wars movie, including a near-canon breaking contortion act to get the gold droid in Star Wars: Rogue One, Threepio is sitting out of Han Solo’s origin adventure. The story doesn’t end there, however. Speaking to Uproxx, father-and-son screenwriters for the Han Solo movie Lawrence and Jonathan Kasdan reveal that Anthony Daniels, the man behind the droid, does make a cameo in the Han Solo movie, making him, not C-3PO, the only person to appear in all ten (!) main Star Wars movies. So, who is he playing? “In the Papillon type offshoot story, the Wookiee that helps them escape, Chewbacca’s best friend, is played by Anthony Daniels – and beckons him to join them as they escape on a different ship,” Jonathan Kasdan explains. Keep your eyes peeled for Chewie’s BFF (pre-Han, anyway) as beneath all that fur and nonsensical growling lies Star Wars’ most esteemed veteran. Sure, he’s not playing C-3PO but the movie still saw fit to honour him with a walk-on part anyway, which is nice. Besides, fitting Threepio in might have been a logic-bending stretch that even Han couldn’t talk his way out of. If you’re desperate to see what others made of the movie, no C-3PO aside, you can see the first reactions to the Han Solo movie right here.